EUCCK Vice President Peter F. Thewlis invited H.E. Lee Sang-Soo, minister of labor to a luncheon meeting held at Grand Hyatt Hotel on April 25, 2006. During the meeting Minister Lee delivered a speech under the title of "Labor Policy Directions for 2006" Among the VIP participants were Finnish Ambassador Kim Luotonen and French Ambassador Philippe Thiebaud. The following is the the full text of his speech. I would like to thank the businesspeople gathered here despite your busy schedules, and I would also like to express my gratitude to Vice President Peter Thewlis and the personnel of the European Union Chamber of Commerce in Korea for giving me this meaningful opportunity. 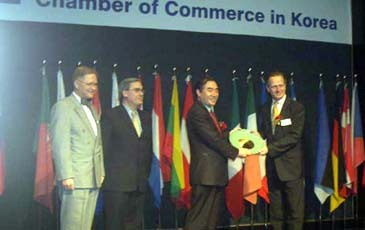 The economic cooperation between Korea and Europe is expanding gradually. The EU has emerged as the biggest investor in Korea last year. On behalf of the Korean government, I would like to take this opportunity to thank you for your contribution to the Korean economy. I think you may have many difficulties while doing business in Korea due to institutional and cultural differences. I also conjecture that you may especially have concerns for the rigid labor market of large conglomerates and some confrontational industrial relations. Today, I would like to give you a brief explanation of this year's labor policy directions for the advancement of the labor market and the industrial relations, and I hope to hear your precious opinions and comments. The intensification of globalization and market competition, the knowledge-based economy, rapidly falling birth rates, acceleration of population aging and fast growth of the Chinese market, etc. are bringing many changes to the overall Korean economy and society. However, the systems and practices regulating the labor market are still bound to the old paradigm, and are not creating a competitive order that corresponds to the new economic environment. The interaction between unstable industrial relations, labor market rigidity and polarization problem, and vulnerable social safety net, etc. have made an inefficient labor market structure, and are creating concerns for the erosion of growth potential as a result. Thus, we must pursue global standards to prevent the slowdown of growth engines, and to overcome jobless growth. On the other hand, we have a duty as a community to care for those who are left behind due to the polarization resulting from this process. Therefore, the important task of today's labor administration is seeking the advancement of industrial relations while resolving the labor market polarization. I have many chances to listen to the businesspeople. And many of them say that it would be much easier for them to do business if the industrial relations issues are solved. I am sure that you feel the same way. Industrial relations have much improved since the inauguration of the Participatory government. The number of strikes has been reduced, and subsequently, the number of lost working days has halved. But, it is true that uncompromising practices still remain in some parts. If labor movements are not guided by the "all or nothing" principle, and are carried out through a phased mindset with recognition of the reality, they will not only be able to benefit the businesses, but also garner support from the public. Some businesses say that unions make excessive demands without knowing the companies' real situations. This is true. But, the business people should regard the unions as partners as well. There is an old saying in Korea, "If the lips are gone, the teeth are left cold." I want to ask you to share the view that the relationship between labor and management are similar to that of lips and teeth. As you can see, dialogue is very important, but equally important is making an environment favorable to dialogue. Some people disapprove of European style social agreement on the grounds that the unionization rate is low, and that there are no powerful pro-labor political parties in Korea. Nevertheless, I believe that social agreement is essential for tackling the problems faced by the Korean society, and for seeking a new order together. To this end, we are planning to establish multi-stage dialogue framework such as the Joint Meeting for National Integration, central-level Tripartite Commission, and tripartite consultative body by region and industry and workplace-level Labor-Management Council. Also, the dialogues should deal with agenda that are not too sensitive, but cover subjects such as job creation and workplace innovation, which can induce social consensus, create a win-win situation, and sufficiently draw out an agreement. The Tripartite Representatives Meeting held on March 15 has jumpstarted the dialogue, and sooner or later opinions will be converged first on measures to reorganize the Tripartite Commission and the Labor Relations Commission. The government plans to legislate the Roadmap through sufficient dialogue with labor and management. Although it is true that there haven't been enough discussions because both labor and management have tried to emphasize only the disadvantages each will get from the Roadmap while hiding the benefits, we do not have much time considering the fact that multiple trade unions will be introduced from 2007. The government has been making preparations on its part. I will describe to you some of the important points at issue. The government plans to leave the unification of bargaining channel for multiple trade unions to labor-management autonomy, and is reviewing measures to give bargaining rights to unions representing the majority if this fails. It will ban payment of wage to full-time union officials in principle, but is also thinking about a compromise plan in which wage payment to one or 0.5 full-time official in small and vulnerable unions is allowed. The government, by all means, plans to conclude legislation of the Roadmap this year, but also has a strategy to pursue this in phases, first starting with achievable tasks. In any case, the government will make its utmost efforts to bring out concessions through dialogue. Next, I would like to talk about policy directions for resolution of polarization. First is the problem of labor market rigidity. As the world economy globalizes, flexibility is becoming an essential precondition rather than a matter of choice. If you look at the level of flexibility of Korea's employment protection legislations, Korea is placed at the 12th among 28 OECD countries surveyed, which means that they are quite flexible. Thus, it would be hard to say that the Korean labor market is rigid in legal and institutional aspects. The labor market in Korea is polarized. While you can witness much security among regular workers and large conglomerates, you can even see too much flexibility among SMEs and non-regular workers with employment adjustment being carried out quite easily. Militant labor movements, provisions that overprotect collective bargaining, and less pressure on regular workers to make concessions through the use of non-regular workers and in-house subcontracting are leading to the view that the labor market for regular workers and conglomerates is rigid. Therefore, the target for flexibility policies should be regular workers and large enterprises. Also, the focus of the policies must be on 'wage flexibility', which can be achieved through increasing the share of wage payment based on job and performance, and introducing the wage peak system, as well as on 'functional flexibility', which refers to easier shift of work and workforce. Meanwhile, I think that active measures such as protection of working conditions and expansion of social safety net are necessary for the vulnerable working class such as non-regular workers in SMEs. The bill on non-regular workers currently promoted by the government aims at enhancing employment security, and is the result of concessions made by both labor and management. After over 4 years at the Tripartite Commission, related ministries and the National Assembly, the bill was finally approved by the Committee on Environment and Labor through an agreement between the ruling and the opposition parties. I am certain that it will be passed this month or in the beginning of May. The legislation has been promoted through a long period of dialogue and compromise, and is a realistic and rational choice which reflects international standards and Korea's economic and labor environment. Some unions argue that it will produce more non-regular workers, but I don't think this is true. At present, fixed-term workers are being used recklessly for a long period of time because there are no legal restrictions against it. But from now on, the period allowed for using fixed-term workers will be limited, and unnecessary use of these workers will be reduced as a consequence. Discrimination correction committee will be established in Labor Relations Commission, and this committee will make judgment on the existence of discrimination for each case, order corrective measures, and will impose default fines up to 100million won for incompliance. Of course I understand your difficulties as business leaders. However, I believe that using non-regular workers expediently for regular jobs can not be justified. Legal measures alone will not solve the non-regular workers problem. Together with this legislation, the government will prepare, and push ahead with ‘The Five-year Plan for Improvement of Employment Non-regular Workers' in the first half of this year. This Plan includes employment security and vocational development measures for SMEs and micro-companies. Now, with the changed labor environment, the concepts of lifelong workplace and lifelong job have disappeared. One person can change jobs 3 or 4 time his/her lifetime. Therefore, it is all the more important to establish a mechanism in which we provide people with training suitable for the jobs we need, and efficiently connect these people to the jobs. The government is increasing investment in training for enterprises and workers to support lifelong vocational competency development. While in-house training is active in large enterprises, it is not so in SMEs employing a large number of non-regular workers. The government seeks to provide training to SME workers to help them become regular employees. It also plans to provide region-oriented employment service by organically integrating employment assistance centers with vocational training agencies and the Employment Information Service, and to build employment-related governance by expanding this service to local governments, citizens' groups, as well as to labor and management. Moreover, the government will faithfully ensure working conditions of vulnerable working classes such as non-regular workers, women, juveniles and the disabled, and will create social service jobs and other jobs suitable for them. In the meanwhile, it will try its best to expand the social safety net by raising the employment/industrial accident insurance benefit rate. Actually, those around me tried to talk me out of taking office as the Minister of Labor, saying that Labor Minister an incredibly difficult job, and it will do me no good. But, I'm working hard with pride, reminding myself that I have some expertise in this field, and that labor policy is taking up bigger and bigger role in the Korean economy and society. I used to think that value was a matter of choice, but now, I'm beginning to think that it is rather a matter of harmony and balance. Judging from my background, some people have expressed concerns that I might become a pro-labor Minister. However, I will implement policies consistently as a fair mediator with a cool head that matches my warm heart. I promise to help facilitate your business activities by identifying and improving the difficulties faced by foreign-invested companies in the process. I hope for your success in your businesses in Korea, and more investments and job creation from you.